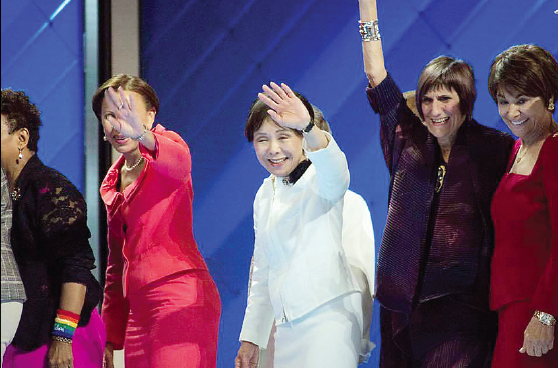 PHILADELPHIA — Rep. Doris Matsui of Sacramento was among the speakers at the Democratic National Convention on Tuesday. Led by House Minority Leader Nancy Pelosi of San Francisco, a group of female members of the House spoke about the significance of Hillary Clinton being nominated for president and the importance of legislation that will support women and children. “Today, the success of women is more important than ever to the strength of working families,” Matsui said. “Women are fueling the future of the American economy. That’s why House Democrats created the economic agenda, When Women Succeed, America Succeeds. “We have four keys to unlock the full potential of women and working families: fair pay – raising the minimum wage and ensuring equal pay for equal work; paid leave – empowering women and men to balance the responsibilities of work and family; affordable, quality child care; and strengthened retirement security for women to enter their twilight years with confidence and dignity. We will fight Republican attempts to weaken Social Security. Matsui was followed by Reps. Jan Schakowsky of Illinois, Nydia Velazquez of New York, Suzan DelBene of Washington, Bonnie Watson Coleman of New Jersey, Lois Frankel of Florida, and Katherine Clark of Massachusetts, along with Florida congressional candidates Stephanie Murphy and Val Demings.